The 17th Knesset elections are over, and unless something drastic occurs, Kadima, with its kleptocratic leadership and legacy agenda from Ariel Sharon, will form the next government. The election results were Sharon’s last vote of public confidence, especially in light of the Hamas sweep on the West Bank and Gaza. Were it not for the now-departed leader, the right-wing and Nationalist factions would have garnered more votes, and Israel would be poised to carry out the once-reviled concept of population transfer promulgated by Israel’s fascist parties. 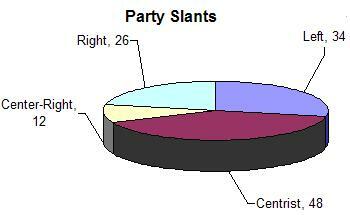 The results are indicating the shifts in not just Sharon believers, but in demographics. While Likud certainly imploded with Sharon’s departure from the party he helped found, an analysis of the parties shows some important changes in party lines. Lets start with what look, at this writing, to be the players. 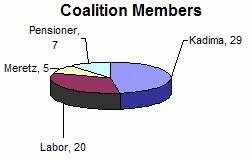 Kadima and Labor are obvious pieces of the puzzle. The Knesset has moved from a crowded center to a more liberal slant. Some of this is certainly issue voting on disengagement from the Palestinians: Pensioners and Kadima are certainly not ‘Left’ in this respect, but it should work: at least until the disengagement is complete. My vote is that Likud will join after that, and push the Knesset further right from its current configuration. 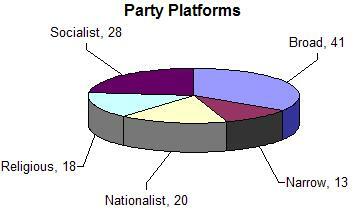 The religious parties are losing ground to secular parties. Only Shas, the Sfaradi Jewish Party, is a factor in the coalition, and then only if necessary to balance Meretz’ possible waffling on Kadima agenda issues. The only reason for the religious parties’ lessening of power is that the Nationalist religious parties don’t truck with the rabbinically-governed parties such as Shas and UTJ, whose rabbis govern the actions — and votes — of their delegates. 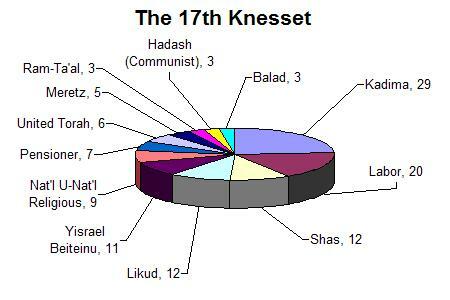 What’s interesting is that there are 34, versus 30, religious and ultra-religious members of the knesset. The secular special-interests are a growing force: Pensioners are actually in the cabinet, and Yisrael Beiteinu touts itself as an immigrant party. Together they add up to an 18-seat bloc that bears close watching on social issues. Israel’s apparent upcoming parlimentary stability is a good thing: Israelis will need to be able to focus on the substance of the Knesset’s work: Hamas, Iran and critical (and basic) social net issues.